At some point, every house in Australia is going to be migrated to the NBN. We are not going to get into the politics or rights and wrongs of it; we are just going to talk about what you can expect and where there are potential problems or pitfalls you may run into that we have gleaned from personal experience. NBN Connection Box – installed inside your property and is the thing that your broadband modem is connected to. New Modem (optional) – this comes from your internet provider as most existing modems are not NBN compatible. So far, so good. But it amazing how installing just three little bits of equipment can go wrong. There are a stack of flavours of NBN, with different areas being connected in different ways. Depending on your location, you may get a fibre-to-the-premises, fibre-to-the-node, fibre-to-the-basement, fibre-to-the-distribution-point, HFC Cable, Fixed wireless or Satellite (Sky Muster) connection. It pays to know what type of connection you are getting, as most internet providers have different divisions handling the different types, which means you can get the major run-around if you click the wrong one when facing their automated phone “click 1 for HFC, 2 for fibre-to-the-premises” choices. NBN Co is the peak body in charge of the NBN rollout. Check out their website for more information about the different types of NBN and to find out what you will be getting at your property. Before you can get NBN connected, you may need to have a trench dug through your prized petunias in your front garden, from the street to your home. Generally, the trench diggers and cablers will take the easiest route to your home, so although you may want your utility box to be in a certain place on the outside of your home, the cablers may have other ideas. While they will try and consider your wishes, jackhammering up expensive driveways, concrete footpaths or digging through retaining walls is not their preferred method of installation. However, be aware that your turf or plants may be removed to make the installation happen. The trench diggers and cablers are supposed to return your property to as good a condition as possible, although if they did have to cut through concrete, it will never be perfect. A standard installation allows for 60 metres of cabling from the street to the Utility Box, although we have heard stories from our clients of installers bucking at more than 10 metres and demanding extra payment from the homeowner. To be fair, a lot of the contracts for the connecting of the NBN to homes is at a fixed price for the installer, so a tricky install and rectification can cost the installer big money. It’s not supposed to be your problem but it is something to bear in mind. The utility box is the outside piece of equipment and is connected to an outside wall of your home. It must be in a dry location, easily accessible and clear of obstructions. The utility box location must join the end of the cable, which is why many homes now have a permanent not-so-decorative feature on the front of their home rather than around the side where they owner preferred. Of course, the team who digs the trench will rarely be the same team that installs the utility box, so the connection of the cable to the utility box happens over at least two visits. In the MBRC and BCC, we have heard of many cases where people have had the utility box installers turn up, only to find that the cables haven’t yet been laid. This means your NBN installation gets bumped to the back of the queue while the cables and trenches are done. Only then does the installer come back for another visit. Where your NBN Connection Box is located can determine the speeds you get from your connection. 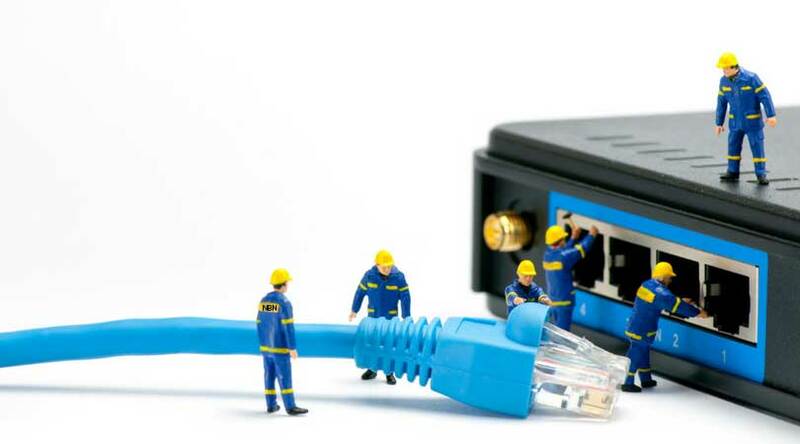 Your connection box needs to be within 3 metres of a 240V power point and ideally located near the current main internet connection or telephone point where you may already have the network cabling installed out to the rest of your home . 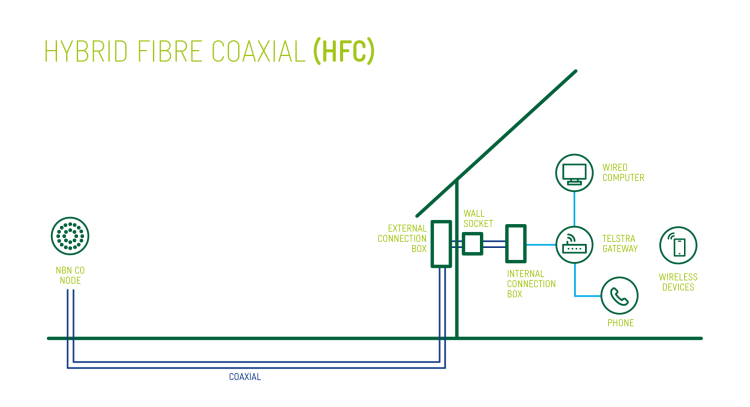 Theoretically, a standard installation allows 40 metres of cabling from the utility box to your NBN Connection Box inside your home. What we are finding from client after client, is that the NBN Connection Box Installers aim to install the NBN Connection Box directly through the wall closest to the utility box (no matter if it is a living room, kid’s bedroom or bathroom). They are totally ignoring the recommendation for it to be near your current main internet connection or phone point. If you push hard, you may get the installation shifted down one room, but be prepared to negotiate (i.e. heatedly argue) to make that happen. If the installer refuses to install the NBN Connection Box where you want it (e.g. your home office or kitchen), they may tell you that you need an electrical contractor to run the cables for you from your preferred location back to the NBN Connection Box. Of course, this is at your cost. We get called to multiple clients each week, working out ways to get cabling from the NBN Utility Box to the client’s preferred location for the NBN Connection Box. Once your electrician has run the cables to where you want it, then the NBN installers may have to come back and connect the cables to the Utility Box, and add in a new wall socket to connect the NBN Connection Box. We also get regular callouts where the NBN Connection Box installer has done a dreadful job with the wiring. We have seen cables running across floors, hanging down from ceilings and dangling from staircases. We then have to work to create a neat, safe and tidy installation for our clients (all at more cost to our clients). NBN Connection generally means no existing phone sockets in your home will work. You either need to have them rewired (at your expense) or purchase wireless phone handsets that connect back to a base that is plugged into your modem (at your expense). In some instances if the old incoming 2 pair copper cable is disconnected from the existing phone points the phone jack on the NBN modem can be “patched” into a nearby socket enabling those sockets to become active. If you have an existing security or fire alarm system, it may no longer work when you have the NBN Installed. You need to contact your alarm provider before you get connected to find out what changes you will need to make, and you may need additional wiring installed. Some of the alarm companies are going to 3G dialler units to allow your alarm to ring out on the mobile network but be aware that this may be at an extra cost, and if your alarm unit is in a cupboard behind a stack of your old shoes the coverage may be non-existent or patchy. If you have a medical alarm or emergency auto dialler, you need to register it on the NBN’s Medical Alarm Register. This is supposed to minimise any problems during the transfer to the NBN. Before you connect, make sure you contact your medical alarm provider to find out if your device will continue to work on the NBN, and if you need an alternative system. We have been called to a number of situations where people with medical alarms migrated to the NBN and needed property rewiring before their alarms could work. This meant their alarms were out of action for periods of time. Our biggest tip is if you have a medical alarm or alert, make 100% sure that your devices are compatible before you allow anyone to flick the switch to NBN on your home. Again, a lot of these units are being swapped for 3G compatible diallers but be aware of connection or coverage problems. Also, if you have friends or relatives with medical alarms who are getting NBN installed, try and be there for each installation appointment, so you can troubleshoot and negotiate on their behalf. We have heard and read about horror stories where alerts are disconnected and the person has no way to call for help. Remember that any electrical equipment connected to the NBN won’t work during a blackout (which includes your medical alarms). You will need to make sure that your NBN installation has a battery backup to give you a few hours of coverage during blackouts. If you use EFTPOS or Hicaps in your business, the terminals may not be NBN compatible so you may need new ones or new wiring installed. You also have the problem that in a blackout, these terminals won’t work so that you may need a battery backup for your NBN installation. Other things that may not work when your NBN is connected are the emergency phone in your lifts, teletype machines for hearing impaired people and your humble fax machine. Again, speak with the provider of your equipment to check compatibility before you connect. Some areas had their free to air TV delivered via cable through the Telstra Velocity scheme. NBN installation can create problems if connections need to be rectified and the poor sparkies are not aware of the Velocity program. If you are in a Telstra Velocity area, make sure that your electrician is aware of it and what it means before they do any NBN related work. While the NBN promises a lot regarding internet speed to homes, there are many potential problems that you need to sort through before you can sit back and binge watch Game of Thrones episodes on your home computer. 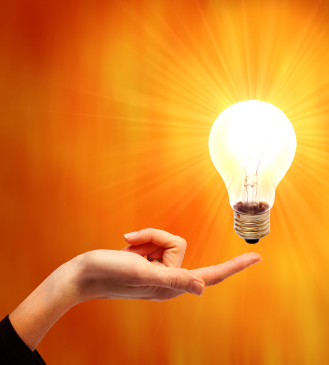 If you need a hand getting your connection to where you want it to be, or rewiring connections for safety, then give us a call. Need help getting your NBN connection where you want it? Call us!